The sunset above appears to be happening in spite of the storm. Although, in reality, the storm and the sunset are one and the same. The foreboding dark clouds were back lit by strong reds and pinks. It reminds me of the feeling of beginning to rise out of the abyss of a major illness or depression. It carries for me a sense of hope, of resilience and of Grace. It seems like that is enough said. I do not wish to detract from the message of the photo and the quote. Mabry Campbell is an exceptionally talented photographer. He blogged that he goes for inspiration to this video of Wyman Meinzer’s wonderful nature photography. So I checked it out. It is tremendous. I particularly like the second half of the video for its drama and energy. I highly recommend this video, as do I Mabry Campbell and his impressive photography which can be seen at mabrycampbell.com. This is my GO TO video when I need a little inspiration. Wyman Meinzer is the official photographer of The State of Texas (pretty cool title!). I know you will find his photography awe-inspiring. Enjoy his West Texas is a hundred or so photographs in 4 minutes!! On Christmas day, the sky was heavily overcast. There had been rain the night before. I expected that there would be no visible sunset. However I also knew that some of the most spectacular sunsets occur as the sky is clearing after bad weather. An hour before sunset, the sky was clearing a little on the other side of the mountain range, about 10 miles away toward the west. Not expecting to find anything worth photographing, I went to a spot with a panoramic view of the sky and mountain range. The sun then set uneventfully (no color), hidden behind clouds. However, five minutes after the actual setting of the sun, the overcast condition quickly broke up, and the sky became bright gold in front of me plus overhead, to the sides and behind me. Then the sky turned pink briefly and faded away. Wow! I could not capture the entire amount of sky involved. To include as much sky as possible, I took several series of images for panoramic composites. My willingness to take the camera to what I expected to be a “no show” sunset, led to experiencing one of the top ten sunsets of my life. This caused me to think about other aspects of successful sunset photography. Go often: The majority of sunsets will not be impressive. However, if you are not there, you cannot get images of the great sunsets when they do occur. (I am still unable to predict whether a sunset will be exceptional). Arrive early: Sun rays coming through clouds (traditionally called “God rays” by photographers) can be most prominent up to an hour before the sun actually sets. Plus, arriving early will allow you to scout out good locations and foreground subjects. Stay late: The best color (pink and red) often occur 20 to 25 minutes after the sun sets. Bring a tripod: Exposures of the last pink or red can be several seconds in duration. The most dramatic sunsets occur when the weather is changing, particularly when bad weather is moving out. I processed the original RAW format images in Photoshop Elements raw converter. Brightness, vibrance and clarity were added. Noise, both luminance and color, were reduced. A tiny bit of sharpening was added. Here is the result on a single frame. Although improved via raw converter processing, the images (like the single frame above), the color is a little dull and the lighting a little flat. Therefore, after generating a panorama using Photoshop Elements panorama tool, I used Nik ColorEfx Pro4 (once again, to the rescue). I used a little Pro Constrast and a little Color Range Contrast with good results. Finally, I sharpened via Nik Sharpener Pro 3.0 (which I love). The final composite is the image at the top of this post. It is made from 7 images taken from side to side with the camera in a vertical orientation and a one third overlap between frames. I welcome comments, criticism and suggestions for future blog topics. I am available at my photo enhancement website (NaturePhotoRehab.com) to assist clients with transforming their common nature photos into uncommon works of art that they are proud to give as gifts or to hang on their own wall for inspiration. Flower Fireworks – Happy New Year! Thank you all who have visited my blog this past year. Especially, I wish to thank those people who are following this blog and who have provided comments on my posts. I wish for you all, health and happiness. Happy New Year! I have found inspiration in the posts of many of you. I cannot remember the last year that I made resolutions. This year, for whatever reason, I have decided that resolutions are appropriate. a picture of something that I have never before seen, or at least that I have never seen depicted in that style (Yesterday’s find was Guy Tal’s marvelous landscapes that he has processed as paintings (http://guytal.com/gtp/gallery/index.jsp). Show, through my actions, that I love someone. Become conscious of at least 20 things for which I am thankful. Recommit, through actions, to my values and priorities. Post more often on my blog, not worrying about proper grammar or punctuation. 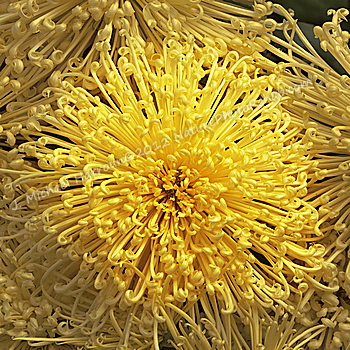 The photo at the top of this page is a large chrysanthemum, each bloom of which is at least 4-6 inches in diameter. Usually close up photographs have a shallow depth of focus, that is, only a portion of the subject is in focus. This photo is almost entirely in sharp focus, because of using a technique called focus stacking. Multiple images are captured that are exactly the same except for the area in sharp focus. In this case, 41 separate photos were taken, beginning at the closest point of the flowers to the lens and working toward the back of the flowers with the focal plane of each photo being 2 mm deeper than the last. Then all the images were processed with Helicon Focus software (from http://www.heliconsoft.com/heliconfocus.html), which does an unbelievable job. (I highly recommend it both for close up/macro work, and for landscapes.) If you are interested in more information on focus stacking, please check out my first two posts of this blog. Again, I wish you all a Happy New Year! I welcome comments and criticisms (mostly comments). 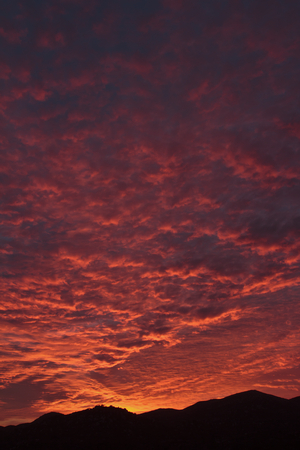 Recently I have been photographing primarily skies, particularly sunsets. They wake me up and give me inspiration. I have some wonderful images, but have been not posted any because I was too busy to write my usual “article” for a post. Therefore I have posted nothing recently. During this time I have been increasingly reminded that it is better to “something” well rather than to do “nothing” perfectly. In other words, the Best can be the enemy of the Good. After all, it is only I who knows what my initial intentions were, and that I did not complete them. This is a lesson that I am continually “learning” again and again. Now I will remember to put it into practice (for a while). 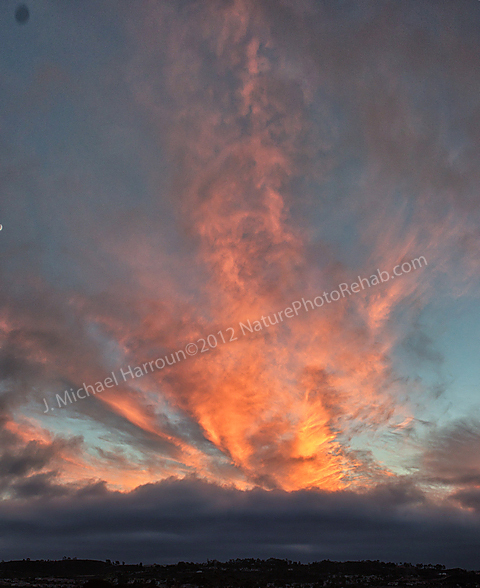 The sunset above is in La Jolla, California earlier this month. It is a panoramic composite of 5 vertical images (done in Photoshop Elements) and processed in Nik Photo Efex4. I love both programs and recommend them. (For the person just starting out with photo enhancement processing, I recommend buying a older version of Photoshop Elements, such as version 8 (the newest is version 11). It has impressive capabilities, but a low purchase price on eBay. No good manual comes with the program. I strongly recommend also getting “The Photoshop Elements 8 Book for Digital Photographers”. So at this point I click “Publish”. Ahhh… I feel much better. I am available at NaturePhotoRehab.com where I help to transform clients nature photos into works of art that they are proud to give as gifts or to hang on their own wall for inspiration. Understanding ISO is surprisingly easy. Sensor sensitivity to light: ISO is a carryover from the days of film photography. It referred to the amount of sensitivity to light of a particular type of film. Similarly in digital photography, ISO indicates the degree of sensitivity to light of the camera’s light sensor. This sensitivity is adjustable. The higher the ISO, the more sensitive is the sensor to light. This greater sensitivity of the sensor allows the use of a faster the shutter speed and/or smaller aperture diameter than would be needed if the ISO (and sensitivity to light) were lower. A faster shutter speed is usually an advantage because it increases the probability that the image will be sharp. Electronic noise: The disadvantage of high ISO however, is that more sensitive pixels are more likely to be activated by electron movement within the sensor itself, rather than by the light. This accidental firing of pixels produces red and green pixel-sized dots (color noise) and mottling in areas of uniform lighting such as blue sky (luminance noise). In addition to ISO, the amount of noise within an image depends upon the sensor type and quality.Color noise (also called chrominance noise and chromatic aberration) shows up most readily in the darker areas of your photo when viewed at a magnification of 150% or higher (200% makes this easier for me). Luminance noise (also called contrast noise) areas of uniform color and lighting, such as blue sky, when viewed at a magnification of 150% or higher (again, 200% is easiest for me). Which ISO is best? To minimize the amount of electronic noise in your images, use the lowest ISO setting that allows you a shutter speed fast enough to achieve the effect that you want for that image. Usually, the preferable effect is sharpness. For instance, to “freeze” the motion of a person walking, a shutter speed of at least 1/125 sec is needed. To stop the motion of a person running, a minimum shutter speed of 1/250 sec is needed. In order to have sharp images of sporting activities often requires a shutter speed of at least 1/500 sec. If the light on the scene is low, shutter speeds this fast will not be possible with a low ISO setting, even when using a large diameter aperture. When in this situation, increase the ISO only as much as is needed to achieve your desired shutter speed. This increased noise level just needs to be tolerated or, better yet, removed with editing software. A high ISO is also necessary in very low light situations such as night photography, especially night sky photography of the stars. When slow shutter speed is needed, a low ISO is helpful: Sometimes a blur is the photographer’s desired effect. The most common example is flowing water or waves that one wants to appear smooth or hazy. In this case a long shutter speed is needed, typically 2 to 15 seconds. Using the lowest ISO setting (and a small diameter aperture like f/16 or f/22) will help to get shutter speeds that last this long without overexposing your image. Another example of a specific need for a low ISO setting is when the desired effect is a blurring of a person walking or of moving automobiles, in order to convey the feeling of speed. For those people who do not want to mess with ISO settings, use your camera’s program option for landscape, portrait, close up, action/sports and night photography. Your camera will then automatically provide you with the ISO setting which is usually the best. The higher the ISO number, the more sensitive the camera’s sensor is to light. The higher the sensor’s sensitivity to light, the more electronic “noise” the image contains. To minimize the amount of noise, use the lowest ISO number that allows a fast enough shutter speed to achieve the effect that you want (usually sharpness). Cameras with program options such as landscape, portrait, close up, action/sports and night photography, will automatically provide you with the ISO setting which is usually the best for that purpose. Electronic noise can be removed with editing software. However bold noise removal creates loss of sharpness or decreased saturation of color. When noise in an image usually does not matter: When your photo is going to be displayed on the web or you will make prints no larger than 4 inches by 6 inches, noise will usually not be apparent unless the noise level is very high. (But you never know when you will shoot a remarkable image that you wish to enlarge and print. A high noise level will require special processing for removal). Every digital image contains noise regardless of the ISO or quality of the camera. Noise removal is the first step of image processing by professionals. High ISO creates much more noise than usual, making its reduction even more important. Noise removal is accomplished with editing software (luminance noise reduction and color noise reduction) such as the software that came with your camera, Photoshop, Photoshop Elements, Lightroom and many other editing programs. (The best, and easiest to use noise reduction software that I know of is Nik software’s Dfine program). However large amounts of noise reduction produce slightly blurred images from luminance noise reduction and/or unsaturated (faded) color from color noise reduction. A slightly blurry image can sometimes be saved by applying extra sharpening with your editing software. Desaturated color can be easily fixed by adding a little saturation with editing software. I welcome comments, criticisms and questions about specific photography issues that you may be experiencing. I am available at NaturePhotoRehab.com where I help people have their images transformed into impressive works of art that they are proud to either hang on their own wall or give as a gift. Today I am writing about “white balance”, an essential camera setting if you want accurate colors. White balance is a topic that intimidates many people just because they do not know what it means. It sounds as though it must be complicated. It is really not difficult. What is white balance? Few light sources provide pure white light. Blue sky gives a blue color cast to everything, particularly in shady areas. Most fluorescent lights give a greenish color cast. Tungsten bulbs give an orange cast. Flash lighting has its own color bias. Usually we are not aware of this because our brain filters out this extra information. We perceive something to be white that we expect should be white. Setting a white balance allows your camera to do a similar thing. The white balance setting allows your camera to counteract the color bias of the light source. Can’t I just use auto white balance? Auto white balance allows your camera to guess what the light source is. It will often guess wrong. Then the colors in your image will also be wrong, unless you correct them with editing software. the flash attachment or zigzag arrow is for flash lighting That’s all there is to it. For most of the common image uses, that’s all there is to it. After setting white balance on about 8 different occasions, most people find it so easy that they wonder why they did not do it sooner. One word of warning though. If you are not sure whether you will reset white balance at the beginning of your next shoot, set it back to auto white balance when you are done with this shoot. That way you will not accidentally have it set wrong next time. If you use editing software regularly: The camera raw file format makes white balance adjustments easiest. It is done in Camera Raw processing. If you do not like the results, you can always change it later (Camera raw changes do not change the original image data. Your processing changes can always be removed or replaced). If you shoot in the jpg file format, you can use editing software to remove the color cast, although it takes some guess-work on your part and the changes are permanent (So save the processed image with a different name so that your original will still be available to you). I hope this will be helpful to someone. I welcome comments, criticism and suggestions about this post and in reference to future blog topics. I am available at NaturePhotoRehab.com to assist clients in transforming common nature photos into uncommon works of art that they are proud to give as gifts or to hang on their own wall for inspiration. The adventures and explorations of a mixed media artist and nature enthusiast. Faith, Fashion, & Art with an edge!